Complete with good rubber seal/gasket. 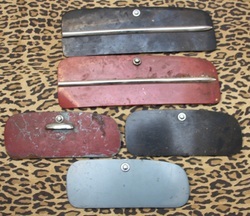 2 x '55-'57 Bullet front indicators. 1 is OK condition, 1 is good condition. 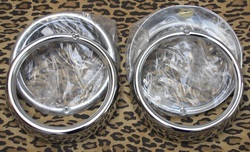 New 70's/80's repro chrome headlight rings. Nice quality, they have 311 part number. NOS Hella Ghia rear lense. 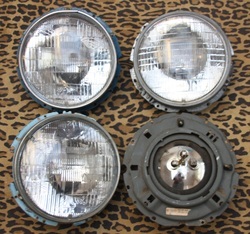 Pair of headlights for a LHD Baja Bug. We usually have a selection of these, so ask for the year you require. Early LHD rear view mirror with sunvisor, chrome is scruffy but otherwise all good condition. 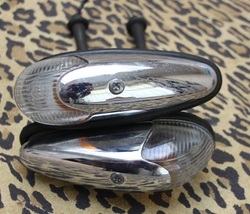 Beetle Cabrio rear view mirror with interior light, chrome is pitted, but good useable part. Always difficult to find when you need one. This was taken from a '65, will fit other years. Brand new in packet Beetle Cabrio door seal, believed Genuine. We have had it over 15 years. Cool addition for that resto.